It's easy to turn a deaf ear to the controversy surrounding recent copyright protection bills like the Stop Online Piracy Act (SOPA) or the PROTECT IP Act, which threatened to curtail free speech on the Internet by allowing the U.S. Department of Justice to blacklist and block access to websites suspected of copyright infringement. Most of us don't visit websites suspected of illegally distributing copyrighted material, so blocking us from accessing them seems harmless. But should your ISP ever be legally obligated to prevent you from accessing restricted websites, it will have to find a way to monitor your online activity, and that could cause your privacy to be compromised if your ISP employs deep packet inspection tools to keep tabs on you. To understand how deep packet inspection works and the potential threat it poses to your privacy, you need to know that your PC packages all the information you send and receive online into packets of data. Internet routers read the labels on those packets to determine what they are, who they're from, and where they're going; this is how most Internet traffic works, and it's how the firewall on your router distinguishes which packets of data make up that email message from your sister and which packets of data are from a spammer in Georgia. When your Internet service provider engages in deep packet inspection, it uses powerful software from vendors like Procera Networks to scan all of the data packets that pass through its network. The contents of each packet are scanned (and sometimes logged), and then blocked or routed to the appropriate destination. 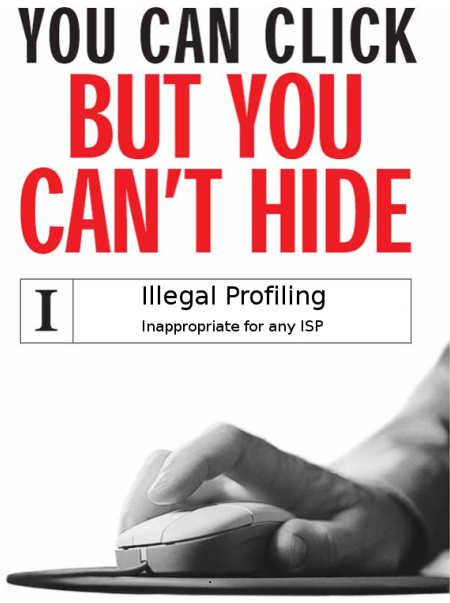 There are plenty of great reasons for your ISP to do this on your behalf: Deep packet inspection helps your ISP block the spread of computer viruses, identify illegal downloads, and prioritize the data transmitted by bandwidth-heavy applications like video chat and VoIP applications to alleviate network congestion and improve your service. Law enforcement officials (with a court order) can use these tools to lawfully intercept communications of suspected criminals. But deep packet inspection has a dark side, and in the absence of strict legal restrictions, your ISP is free to root through all the information you exchange online and use it as they see fit. Personal data like your age, location, and shopping records can be logged and sold in anonymized batches to advertising companies, and law enforcement agents can monitor and curtail your Internet access without your knowledge. Without strict limitations to preserve user privacy, this sort of deep data filtering can significantly impair your ability to remain anonymous online. This level of surveillance is nothing new; Internet service providers in China already employ deep packet inspection software to scan for sensitive keywords and block access to sites like YouTube. Chinese citizens often employ foreign VPN services to access websites blocked by the Chinese government, and you can do the same. "If you want to prevent this sort of inspection, you could use someone else's network," says Steven AndrA(c)s, founder and CTO of Special Ops Security. "I imagine if Congress [ever] enacts SOPA into law, a number of VPN services will crop up in other countries." The key thing to remember is that, even if your ISP or the government is monitoring your online activity, you can proactively protect your privacy by visiting only websites that offer an encrypted connection and establishing a secure connection to a VPN overseas to visit blocked websites. You can use a free tool like HTTPS Everywhere to ensure that SSL encryption is always enabled when available, or go one step further and sign up for a paid VPN service like WiTopia or HideMyNet to circumvent Internet censorship by your ISP or local government. You could even start using a service like XeroBank or the Tor Network to anonymize your online activities via a series of proxy servers. Or you could do nothing, and trust your ISP not to mishandle your private information. No matter what you choose, know that deep packet inspection software is cheap, sophisticated, and employed by governments and Internet service providers around the world. CyberWarfare has it started really? TOP 10 list of the most destructive viruses ever. Anis DKHIL. Fourni par Blogger.